The CS4MX-i is one of C.Scope's newest metal detectors, providing a high level of metal detector functionality with excellent performance, yet ease of use, making this detector ideal for the serious hobbyist as well as newcomer who wants a machine that will meet future needs too. The CS4MX is powerful enough to find real artifacts and will not need to be upgraded if interest in the hobby grows. The "i" in the product name stands for "interchangeable" as alternative search coils can be fitted to this detector. 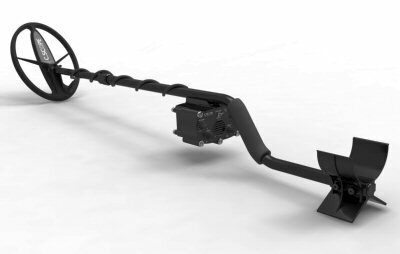 The CS4MX-i is a high performance metal detector operating on the ‘MOTION’ principle. This means that the search-head must be kept moving at a steady sweep speed to achieve optimum performance. The CS4MX-i provides the option of interchangeable search-heads to optimise performance on a variety of site conditions. There are two independent discrimination controls to aid identification; a pinpoint switch to aid exact target location; and a manual / auto ground option to handle all ground conditions.